We start from a parking lot in Glen Coe that already has a view of most of the long ascent we'll be making along the Coire nan Lochan and up to the Stob Coire nan Lochan. The weather isn't perfect, but the clouds are structured and there are some patches of sun, so we're hopeful that we'll have a good day. We clearly won't be lonely: there are already plenty of cars in this lot and the next one and we can see people on their way up through the steep valley between Gearr Aonach and Aonach Dubh. The trail across the valley floor takes us to the beginning of the ascent, which is extremely no-nonsense: plenty of climbing, not much switching back. Up up we go on the nice trail past a group of climbers who have diverted off across the stream to our right and who are looking for the way up to the beginning of their route. 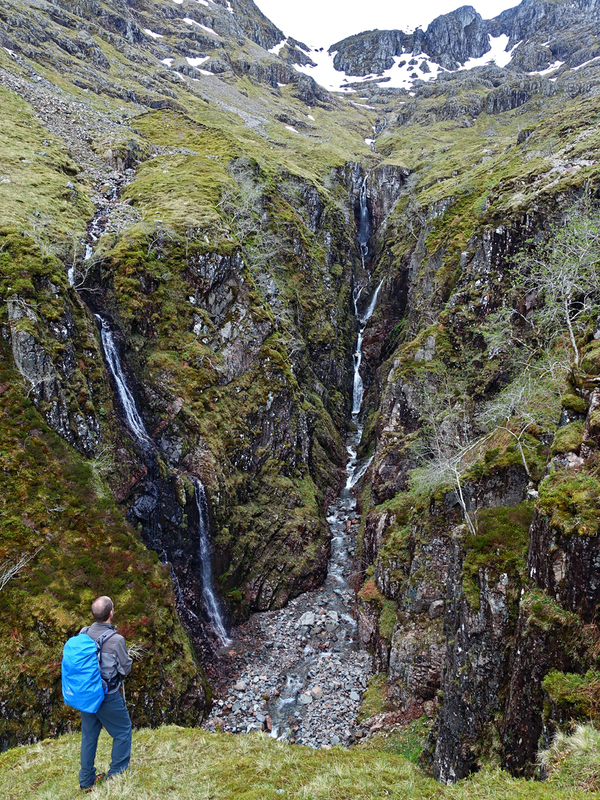 After a steep bit left of a waterfall we emerge on a broad plain surrounded by two ridges leading up to the Ston Coire nan Lochan, which still towers above us. The couloirs to the top are all full of snow, but otherwise things look good. We say hi to a group of guys taking a rest, then head off towards the left ridge. This takes us nicely up, with great views, the last couple hundred meters; there's a bit of scrambling, but not too much. At some point rain threatens a bit, but this ends up not being real (just a few sprinkles). Up top (1115m, our first Scottish peak! our first Munro!) we take a short food break, enjoy the views, and scope out the rest of our hike. We have a good view of the saddle that our planned route leads down from and see that it's full of snow. Since it's also quite steep and we don't have the ice-axes with us we're going to need to figure out a plan B. After the break we continue on along the ridge towards Bidean nam Bian. The path is again quite good and after descending to the saddle between the peaks (you have to go down in order to go up), it's just 150 meters of climbing until we're up top (1150m). Again a short rest (after the first couple minutes we actually have the peak to ourselves) and more enjoying of the views and then we head back down the way we came to the saddle. The slope leading up to this had looked like a good candidate for getting down into the Lost Valley (Coire Gabhail) and this is reinforced when we see a group coming up that way. We cross them at the saddle and start our descent. This is a steep, but easy descent of a grass slope. There's some route finding to make sure we get over all the steps , but soon enough we're at the trail at the bottom of the valley. After a bit on the main trail we divert onto a smaller trail that runs closer to the gorge (with a drop *and* waterfalls, there's no way Andrea is going to stay away!). We follow this very nice (and empty) little path the rest of the way to the foot of the gorge. At the end of the valley the people density starts going up. We follow the path down, down until get close to the river again. There's a nice diversion to a cool spot by the river for pictures, then down again to a river crossing. This doesn't seem doable with dry feet (and certainly everyone here has taken off their shoes to do it), so we return to the cool photo spot and cross there. There's a bit of a scramble on the other side, but a great path above it (we're certainly not the first to have taken that route) that leads us long the lip of the valley before heading steeply down at the end. 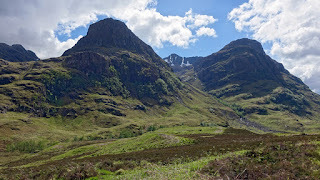 Once on the broad valley floor of Glen Coe, where the road runs, we turn off to the left and back to our car.